We moved on from Boiro first thing in the morning, leaving the yappy dog behind us. Our destination was the Dunas de Corrubedo, a nature reserve on the west coast with a large dune system and (found via wikiloc) some coastal walking. We turned up to a large car park and drove down to the bottom corner to park alongside a few surfers vans. I popped up to the café at the top of the car park and through some poor Spanish on my part managed to work out that yes, we could stay overnight, and that maps and more information could be found at the next carpark up the road where there was an interpretation centre for the nature reserve. After a look on google maps we decided that it would have to be pretty foggy for us to lose our way along the coast path, the hardest part was going to be finding the coast path without crossing the protected dunes, and as luck would have it there was a signposted walk from this car park to one of the lagoons that would take us in the right direction. We didn’t bother going up to the interpretation centre. The sun was shining again as we set off to the lagoon across sandy heathland. Once we reached the corner of the lagoon we turned right towards the beach where we could then pick up the coastal route. We soon left the dune system and moved onto the rocky shore passing on the coastal side of fish processing plants that had an aroma that must have been particularly pleasant to seagulls and fish. At one of the outflow pipes we saw hordes of fish sitting near the surface with their mouths agape waiting to siphon whatever delicacies were being pumped back into the sea, it took us a while to work out what they were as they looked like bubbles on the top of the water. Further out to sea were more active fishes diving into the outflow current with their tails in the air. 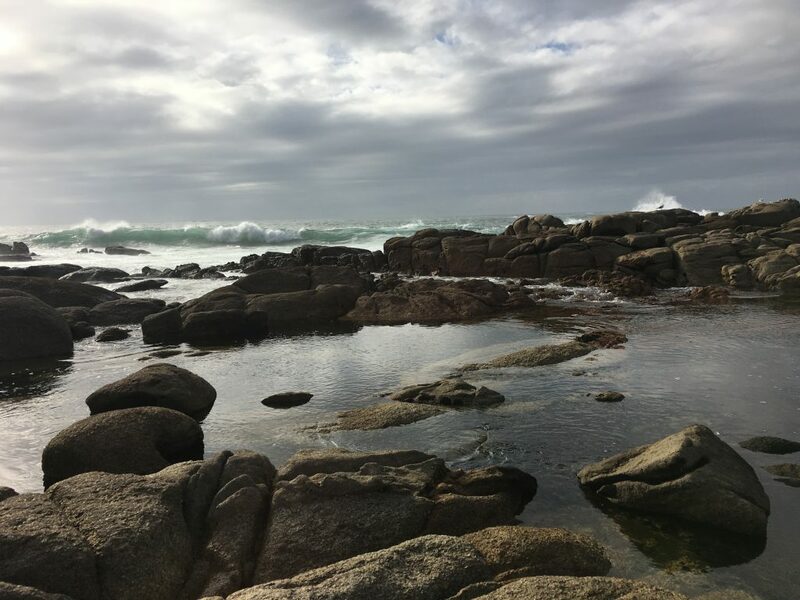 It was easy to follow the paths along the coast, clambering up amongst the oddly shaped granite boulders when we felt like it and dropping down to cross small sandy coves. We saw numerous seagulls, particularly common gulls (not actually that common in the UK) and black headed gulls in their winter plumage, in winter they have white heads with a black spot making it look as though they have two pairs of eyes. 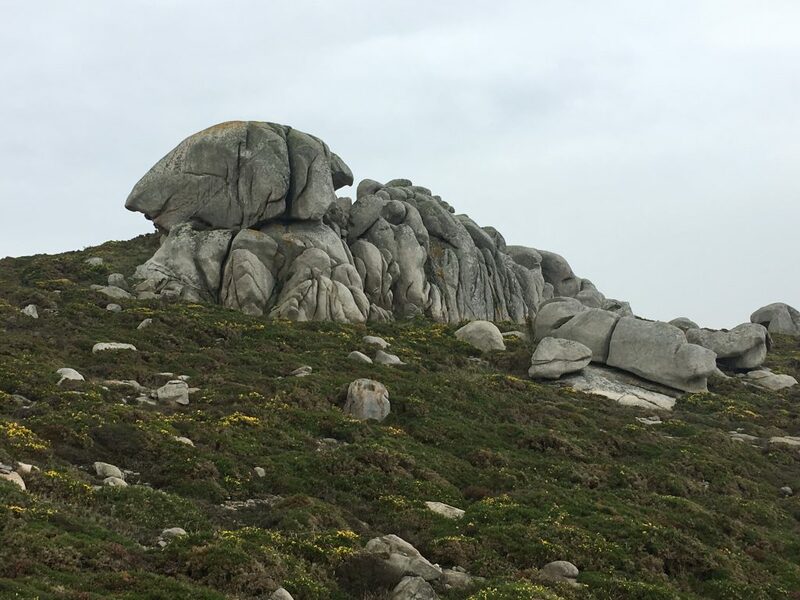 Odd shaped granite outcrops – what can you see? We had originally intended to do a circular walk cutting back inland but, despite the industrial fish processing facilities, we enjoyed the coast so much that we decided to retrace our steps. 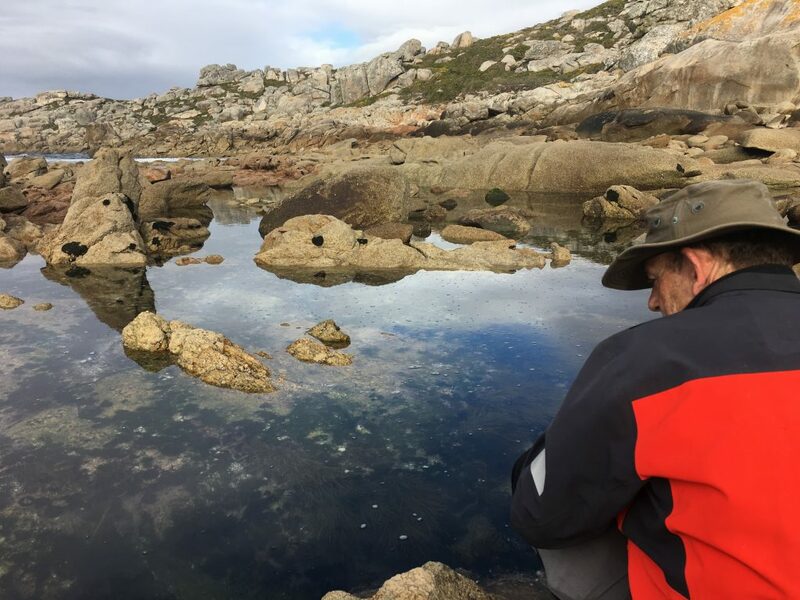 The tide was lower on the way back and we found some large rock pools with healthy populations of shrimp, crabs and baby fish to keep us interested. Once particularly large pool had us so riveted that we didn’t notice the tide turning until a particularly large wave washed water into the rockpool. The tide rushed in quickly after that and we hopped backwards from rock to rock marveling at it’s speed. The incoming tide changed the nature of the sea and we started to see more big surf, we stopped several times on the way back to watch the waves crashing and spraying over the rocks. When we got back to the sandy beach by the car park the surf was impressive, but the surfers had moved on. A couple of cars drove down to watch the sunset but with the cloud there was just a warm glow on the horizon.